Collection contains information on the social history of Coaticook from 1923 to 1937. It consists of photographs, including photos of the employees of D.S. 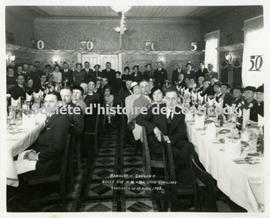 Bachand, a parade float by the Cercle Lacordaire Association Anti-acoolique, the Caron et Fils hockey team, a few women's religious groups, the 50th anniversary of Mr. and Mrs. Louis Couillard, and a photograph of Henri Carbonneau and Yvette D'Auteuil. Collection donated by Henri Carbonneau. Many of the photographs have identification keys, as identified by Jean-Nil Drolet in 2007.